Hi, it's Biscuit again, for the first time in the year humans call 2019. I'm a dog, in case you didn't know. 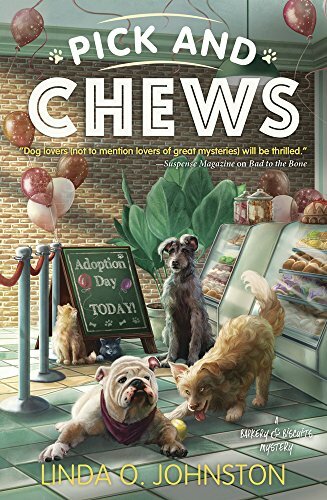 As I've said before, I supposedly belong to Carrie Kennersly, the human who's the subject of the Barkery & Biscuits Mysteries, but in my opinion she belongs to me. Actually, I don't see much different between what was 2018 and now. Carrie still takes good care of me, letting me hang out at one of her two shops, Barkery & Biscuits, where she and her helpers bake the wonderful dog treats Carrie invented. She says that's a result of her being a veterinary technician at the Knobcone Veterinary Clinic. My preference is not to go to that place since they poke me and prod me and even stick needles into me there--even Carrie's good friend Dr. Arvus Kline who owns the place and her very special friend Dr. Reed Storme--so I will take her word for it. And the fact she lets me sample her doggy treats? Love it! She's got several helpers who work in her two shops. The other shop, Icing on the Cake, sells human treats Carrie also bakes, along with those helpers, but I can't sample those. She says it's for my own good since some of them would be dangerous for me, especially the ones that have chocolate in them. Probably more visits to that vet clinic, so I behave and stay out of it. One thing my Carrie talks about sometimes is that she has gotten into the habit of solving murders in this town. What's that? Well, sometimes humans apparently kill each other. We dogs sometimes fight, of course, and some particularly nasty ones might kill others of our kind, but fortunately I've never seen that happen. Carrie has also told me that there's another human around her who describes stories of those killings, called murders, in books that people read. Now, I'm not sure I understand that since I don't read. But I certainly don't mind hearing about how Carrie helps other people by solving those murders, and that's what those books do. She says her most recent story is told in Pick and Chews, which was sent out to the world in a book last year. 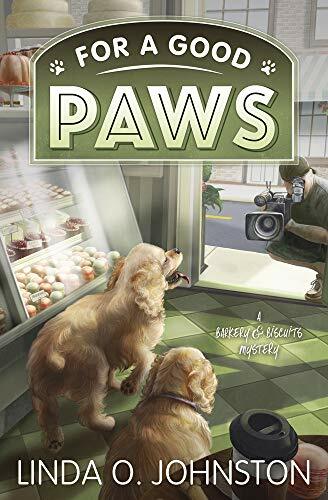 She isn't talking much about it, but she says there's another book, For a Good Paws, that will tell about another murder and what she did to solve it, and it'll be published in the month of 2019 that humans call May. You know, I'm feeling a little hungry, even though my last treat was only a short while ago, maybe ten minutes in human time. I think I'd better start begging, though, for my next treat. So, in the way humans say it, Happy 2019, everyone! Thanks for sharing your and Carrie's story Biscuit. I'm looking forward to your new book in May. Arf--er, thanks for commenting, and I hope you enjoy the new book.